Related link The Westerwood Hotel - Golf Club. Related link The Westerwood Hotel - Reflections Spa. 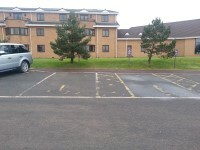 The dimensions of the designated parking bay(s) are 360cm x 520cm (11ft 10in x 17ft 1in). The nearest designated bay is 15m (16yd 1ft) from the main entrance. The door opening is 125cm (4ft 1in) wide. Please call in advance if you require a portable hearing loop as Conferencing and Events may have it. 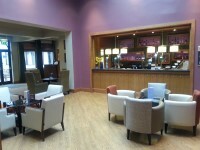 There is also fixed hearing loop available, which is located in the Carrick Suite. You are on Room (122, 123 and 125). Skip to the next section. There are 148 rooms in total. 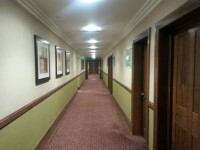 There are 47 standard ground floor rooms. There are 98 standard rooms on other floors. 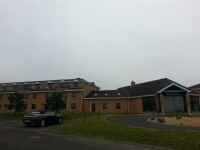 There is / are 3 room(s) which has / have accessible ensuite facilities. 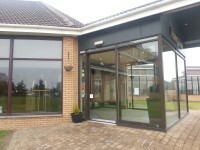 The accessible room viewed is 60m (65yd 1ft) from the main entrance. The room number or room name viewed was 125. 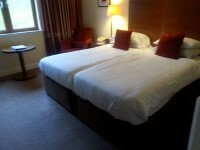 The height of the bed is 60cm (1ft 12in). The width of the door to the ensuite is 76cm (2ft 6in). 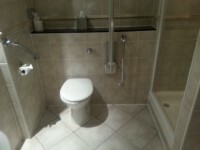 The dimensions of the accessible ensuite are 145cm x 230cm (4ft 9in x 7ft 7in). The toilet seat is 41cm (1ft 4in) above floor level. The height of the sink is 73cm (2ft 5in). No emergency alarm is fitted in the ensuite. The height of the side of the bath from floor level is 48cm (1ft 7in). There is not a shower over the bath. The available auxiliary aid(s) is(are) flashing alarm(s) and vibrating pillow(s). Vibrating fire alarms are available from reception. The number of accessible rooms with baths is 3. You are on Eating and Drinking (Flemings Bar). Skip to the next section. The distance between the floor and the lowest table is 5cm (2in). 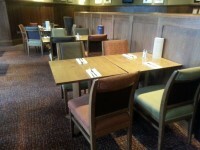 The distance between the floor and the highest table is 10cm (4in). You are on Eating and Drinking (Flemings Restaurant). Skip to the next section. You are on Eating and Drinking (The Grill Bar and Restaurant). Skip to the next section. 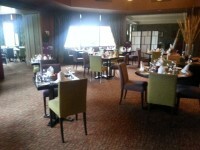 The Grill Bar and Restaurant is located on the first floor of the hotel. The lift is located at the start of the bedroom corridor. The lift is 35m (38yd 10in) from the main entrance. 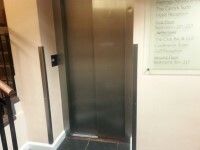 The dimensions of the lift are 110cm x 155cm (3ft 7in x 5ft 1in). You are on Accessible Toilet (Bedroom Corridor). Skip to the next section. 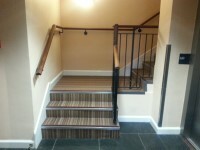 The accessible toilet is located just before the ground floor bedroom corridor. You are on Accessible Toilet (Flemings Bar and Restaurant). Skip to the next section. 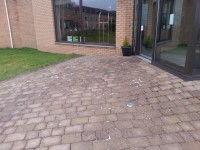 The accessible toilet is 40m (43yd 2ft) from the main entrance. 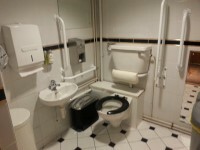 The accessible toilet is located along the corridor next to Flemings Bar and Restaurant. 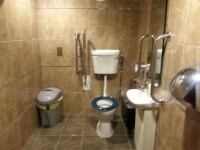 The dimensions of the accessible toilet are 155cm x 215cm (5ft 1in x 7ft 1in). 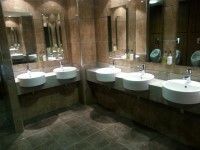 The female and male toilets are located next to the bedroom corridor and to the rear of the Flemings Restaurant. The assistance dog toilet area is located to the front & rear of venue.